I made this pizza 3 times in the last week and a half (that sounds kind of insane when I write it down...). 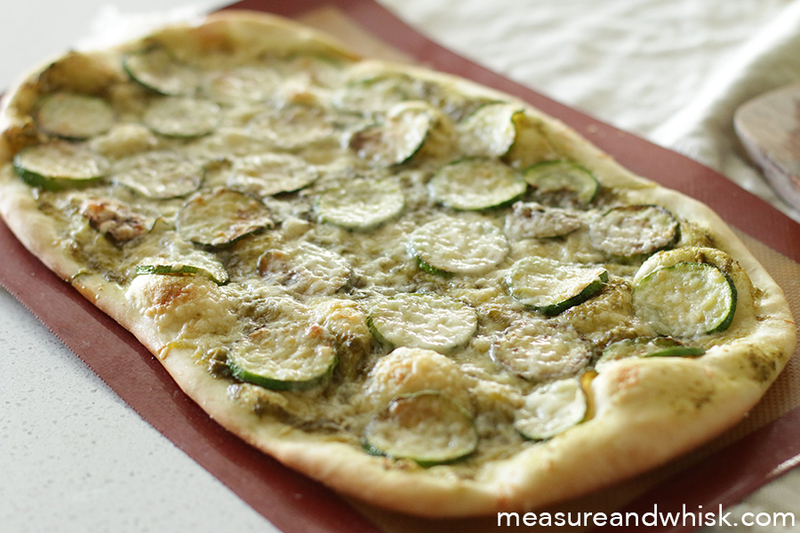 Partially to use up zucchini, it was super easy, and because I was trying to get it just right for this blog! The first time, the parmesan was pretty overwhelming (I used a pretty strong parmesan). The second time, I made it on a whim, because I needed to make something quickly, and I used less parmesan, and it was still really good, but not as strong. The third time was a happy medium where I added a little mozzarella to offset the strong Parmesan flavor. It takes about 30 minutes to make this, from start to finish, as long as your pizza dough is already made. Definitely worth putting on your meal plan this week. Pour your oil in a skillet set over medium heat. Add the zucchini and arrange them so no edges overlap. Cook for about 3 minutes, until the edges begin to brown, them flip the zucchini over and cook for another 2 minutes on the opposite side. While they are cooking, sprinkle a little cornmeal evenly onto a silicone mat. Roll out your dough. 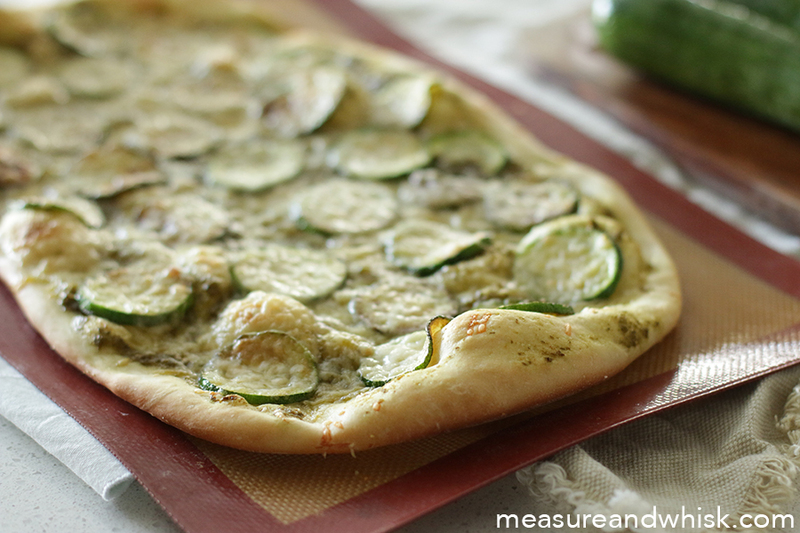 Spread the pesto on top of the dough. 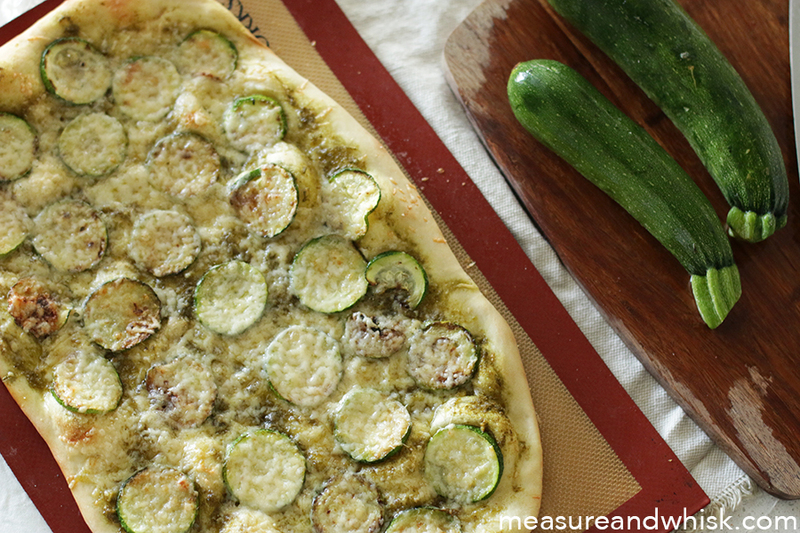 Once the zucchini is cooked, place it evenly (like pepperoni), on the pizza. Sprinkle with mozzarella cheese, then top with Parmesan cheese. Cook in an oven preheated to 450°F for 8-10 minutes, or until the crust is browning and the cheese is crispy. Serve immediately.